Traveling between the different islands is like taking the bus – so laid-back and cheap. Big Island, better known as the ‘Island of Hawai’i’ and therefore commonly referred to as the real Hawai’i, is the active volcano island. All islands in Hawai’i are so different and incredibly diverse. When you fly in you will feel as if you’re landing on a lava field, it is very unique. There are two airports, Kona and Hilo. I flew in Kona both times. The airport is like an open-air beach hut and so cute. From the airport to Kona town you can easily take the bus. It does only run twice a day though, in the morning and late afternoon. For everything else, you will need a RENTAL CAR. Beware, in the States, you will have to bring your passport to pick up your rental car, your normal drivers license and ID won’t satisfy the ‘friendly and helpful’ rental service staff. I was kind of stuck there with a friend once because they weren’t going to give us the car I had reserved. In the end, she rented it which was way more expensive because she was under 25 but we figured it was better than being stuck at the airport the whole day. Also, check to get some extra insurance or have that aspect covered through your normal insurance already. We did not take the extra insurance and were so cautious and scared the whole time…not the best feeling. Make the car reservation ahead of time. Especially the prices on Big Island can get expensive at times but if you’re early you can even get it for half the price. Reservations can always be canceled but once the good prices are gone they’re gone. It makes a big difference! As for ACCOMMODATION, Air BnB is great as it’s quite affordable and the places are just crazy beautiful. My second time on Big Island I was staying in this insane villa up a hill. Since in Hawai’i a lot of houses are built with a so-called O’hana (which means ‘family’) suite those suits are often rented out for Air BnB purposes. We had a whole suite for ourselves for a normal Air BnB price. Near the volcano park, we even had a whole cottage to ourselves which was located right next to the volcano park in the rainforest. I will never get over how unique Air BnB places can be. In Kona, a good option is also ‘My Hawaii Hostel’ which I have been to both times I went to Big Island. They have just opened end of 2015. It’s probably the cleanest laid-back hostel I have stayed at. They don’t have many rooms hence not many people and it’s run by two sisters who are just lovely and very helpful. You will also meet their 3 dogs who often hang out at the hostel. Around Kona area, there are a couple of BEACHES worth visiting like ‘Magic Sands’ and ‘Kahulu’u Beach Park’. They are both walking distance from ‘My Hawaii Hostel’. Kona town can also be reached by foot…if you feel like walking for miles like me (it’s a bit of a longer walk)…or you just catch a ride with someone and ask them to drop you off. If you want to explore the island further you will need a rental car. For the closer located parts you can always hitchhike of course. The other night this girl had arrived at my hostel who I had an instant connection with (‘Lisa, that’s crazy, your playlist has every song I love!’), she was from NZ and reminded me of my time when I was an au-pair in Auckland. We caught a ride chatting with our friendly driver to ‘Cook Trail’. If only we had known how long that trail would have been. We definitely didn’t bring enough water and weren’t expecting to be in the sun for hours. It’s downhill first until you reach the ‘Captain Cook Memorial’ (‘Puh, glad we don’t have to walk this one back up’ ‘Ehm, you know we do right?’). The area can also be reached by kayak leaving from a close-by beach. Since we carried our snorkel gear with us we went for a refreshing swim. I didn’t even want to think about climbing back up the trail…we were literally dying. Once we reached the end of the trail we treated ourselves with the coldest drink and biggest ice cream we could find before catching the next ride to the infamous ‘2 Steps’. 2 Steps was out of this world. It is a famous spot for snorkeling – it’s the place where you’ll find ‘Aloha’ written on the ocean floor. That day it was also the place of the most wonderful encounter when literally out of the blue wild dolphins were paying us a visit. Hawai’i blessed me with so many unbelievable moments, this one was one of them. Another even more powerful one was the dive with the famous KONA MANTAS. Little did I know what was awaiting me on that diving trip. I had heard so much about it but lacked any capacity of truly imagining it. We went with ‘Kona Diving Company’ who I can totally recommend. We were fine making a booking 1-2 days ahead. They tend to go in a bit later than the other diving companies which will give you extra time with fewer people in the water with the mantas. It’s mostly two-tank dives so you will go for a sunset reef dive before doing the famous Manta Night Dive. When you find yourself lying on the ocean floor with your torchlight and out of nowhere a gigantic manta appears and swims right at you, you will feel like you’re in a different world. 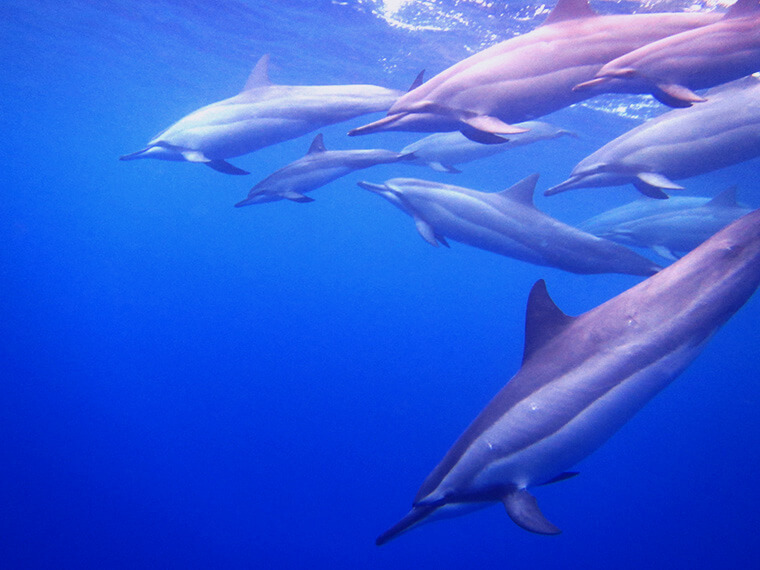 Every move those majestic creatures made, weightlessly gliding through the deep blue, made me feel so insignificantly small…it was their habitat and I was a part of it! And I could have not been happier I got to share the whole experience with someone as it made this unique experience even more intense. I love how shared memories connect people. There are no limits to exploring the rest of the island – I have even done it in 1 day once. I have not seen much of the northern beaches yet though. If you have got more time I would advise you to plan with at least 3 days to make your way around the island that’s what I did the second time. A must is the ‘Southernmost Point’ of the United States (‘South Point’). The landscape somehow reminded me of Ireland, keep driving, keep driving and you will eventually get there. A sign will say ‘no cliff diving’ – your adventurous mind will leave you not caring. Since my first cliff dive on O’ahu I wanted to keep up the tradition to jump off a cliff on every island. The crystal clear turquoise ocean at ‘South Point’ at the edge of the world is just stunning. Be careful when the water is a bit wavy when you climb back up, the rusty ladder is very sharp. It actually left me with a quite nasty scar as I cut myself (apparently deeper than I wanted to admit). Today, it’s probably one of the most beautiful memories I carry around on my body since it reminds me every day that all the wonderful things that have happened are indeed real. Also, pay the ‘Punalu’u Bake Shop’ a visit and grab a ‘Pastramy Sandwich’ and a ‘Macadamia Custard Sandwich Bun’. Drive a bit further to ‘Blacksand Beach’ for a relaxing lunch break. Of course, when on Big Island you will have to visit the VOLCANOES NATIONAL PARK. There are a lot of trails you can do throughout the day. 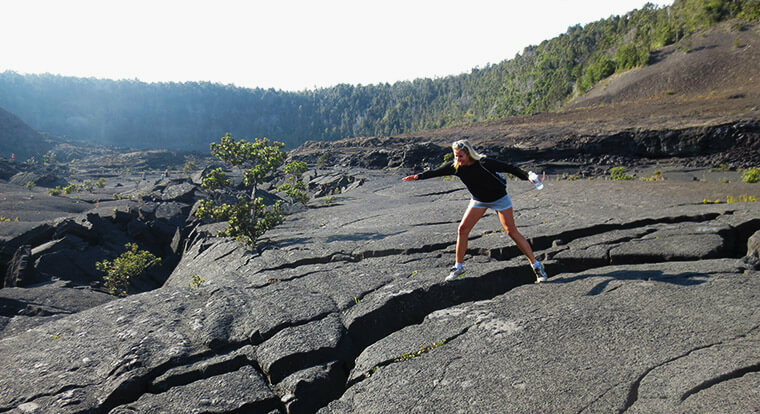 The most famous is the ‘Kilauea Iki Trail’ as you can even walk through the crater. For ‘Lord of the Ring’ fans, you will feel like Frodo in Mordor. Nature is incredible around here. Most of the time we were alone, just us, surrounded by the endless fields of stone hard lava fields. Also, check out the ‘Thurston Lava Tube’ you can actually walk through which is close to the actual trail. Before heading to the plateau to watch the sunset make a stop at the ‘Volcano House’ and enjoy a hot cup of tea or coffee while sitting by a fireplace. 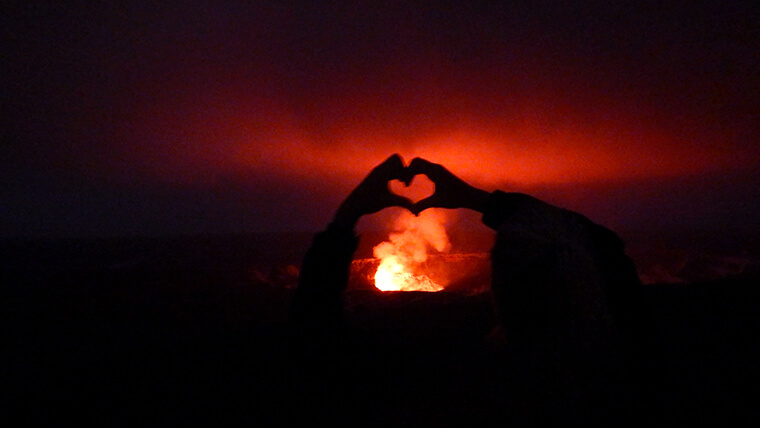 Watching the sunset at the ‘Halema’uma’u Crater’ is a must. It will leave you speechless as the sky gets darker and darker and then transforms in a big red cloud of steam above the active volcano crater. Wear layers of clothes as it gets quite cold and you might want to spend some more time there. Also, take a ride with the car to look at some more astonishing craters in the park. While admiring the ocean view imagine how the active lava was flowing down the mountain to the sea right next to you. HILO is the next bigger town you’ll get to after the Volcanoes Park. At the first crossing to your left, you will find ‘Ken’s House of Pancakes’. I had a stack of Macadamia Pancakes and couldn’t get over the cute diner restaurant atmosphere. I felt like I was in one of those American High School movies and I was so excited I couldn’t even sit still. My American friend didn’t necessarily share my excitement and probably wondered what I was freaking out about. A good place for breakfast in Kona on the other side with an ocean view is ‘Fish Hopper’ which is where I actually had my first Mimosa ever (Orange Juice with Champagne – I had never heard of it before). For dinner ‘Quinn’s Almost by the Sea’ is nice to hang out. It was the perfect place after a long day for us – traveling from O’ahu, driving around with no Wi-Fi, looking for the Air BnB place for ages, almost mistakenly storming another house’s living room, finally finding everything, not having eaten for hours. Also, don’t miss the ‘Donkey Ball Store’, they’ve got all kind of chocolate balls you definitely want to try. Across the street, you will also find fresh fruit. The food experience will be completed by a coffee plantation tour. Big Island is the home of the famous and very expensive high quality ‘Kona Coffee’. It is worth every penny! The farms are located up the hills with a perfect ocean view. You can walk around and try all kinds of different coffees. There are various farms but we thought ‘Hula Daddy Coffee Company’ was a great choice. Actually, on Big Island, I finally was taught how to make a proper coffee…important life lesson. Two more ATTRACTIONS you should visit are on the one hand the pools and waterfalls around Hilo area and on the other hand the Mauna Kea. 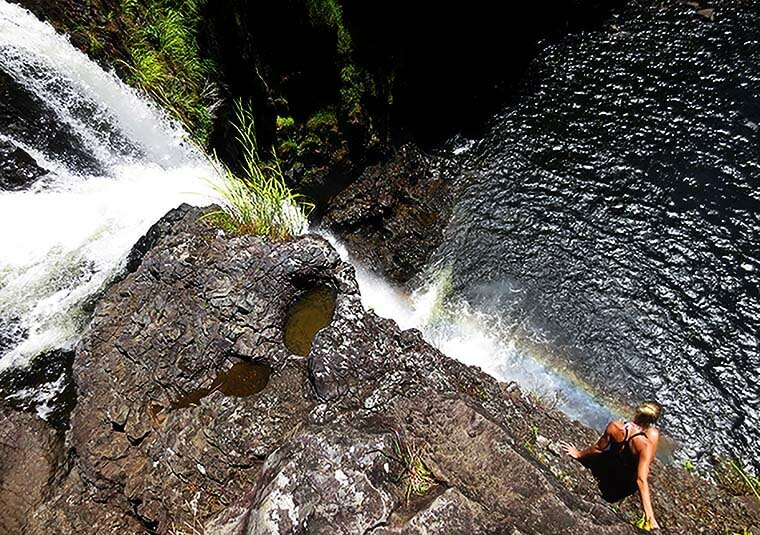 When leaving Hilo, to make your round-trip complete, make your way to the ‘Rainbow Waterfall’. Walk up right to the edge and enjoy the marvelous view down the waterfall with its rainbow colors. Close to the waterfall further up the road, you will find the so-called ‘hot pools’. Well, we didn’t really find hot pools but fresh water springs. Just cross the gate and keep walking down to the water and you can swim in the refreshing clear water with no one around. ‘Mauna Kea’ will be the final highlight. Driving up the mountain is already a unique drive. Drive all the way up to the Observatory. Beware, it will be freezing like crazy up there. It is just magical and you can look through a variety of telescopes and watch the stars. Big Island offers all kinds of adventures: unique ocean adventures, stunning volcano adventures and breathtaking mountain adventures that will make you feel like there are no boundaries as you dive into the colors of the endless sky and watch the formation of cotton candy clouds.